Carcinomas are the most commonly diagnosed type of cancer. It starts in cells of the skin or of the tissue lining of organs, such as the breasts, pancreas, and lungs, as well as the tissue lining of glands. 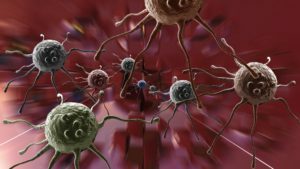 As with other forms of cancer, carcinomas are abnormal cells that divide without stopping and may spread to other areas of the body, but they don’t always. Melanoma typically starts in a certain type of skin cell called melanocytes. These cells make the pigment melanin, which tans/darkens the skin to protect the deeper skin layers from harmful effects of the sun. Most melanoma cells still produce melanin, so the tumors are often brown or black, but it is also , in which case tumors may be pink, tan, or white. Melanomas can develop anywhere, but they are most likely to start in the skin of the torso (back and chest) in men and in the skin of the legs in women. The neck and face are also common melanoma sites. If not detected early, melanoma is much more likely than others to spread to other parts of the body. Sarcomas are relatively uncommon and develop in cartilage, bone, and soft tissues such as fat, muscle, fibrous tissues, deep skin tissues, blood vessels, or nerves. Most sarcomas develop in the arms or legs but may also be found in the neck and head area, internal organs, torso, and the back of the abdominal cavity. There are approximately 50 different types of soft tissue sarcomas. Leukemia is a type of cancer that affects the bone marrow and blood. Cancerous blood cells form and crowd out the healthy blood cells in the bone marrow. How quickly this cancer progresses and how the cells replace the normal marrow and blood cells are different with each type of leukemia, which is determined by the type of blood cell that has become cancerous. A patient’s prognosis and treatment depends on the type of blood cell affected and whether the leukemia is acute or chronic. Chemotherapy is a common treatment for leukemia. Lymphoma is the name given to a group of blood cancers that develop in the lymphatic system, which is part of the body’s circulatory system and a vital part of the immune system. There are multiple types, but the two main types are Hodgkin Lymphoma and Non-Hodgkin Lymphoma. Hodgkin Lymphoma is one of the most curable forms of cancer, according to the Leukemia & Lymphoma Society (LLS). It’s astonishing and daunting to know that there’s so much kind of cancer out there. Good thing that a number of them have treatments such as Chemotherapy for Leukemia. Thanks for the interesting read. I’ll go get myself checked by next week and see if all are still good.